Verpa conica is a curious springtime mushroom. 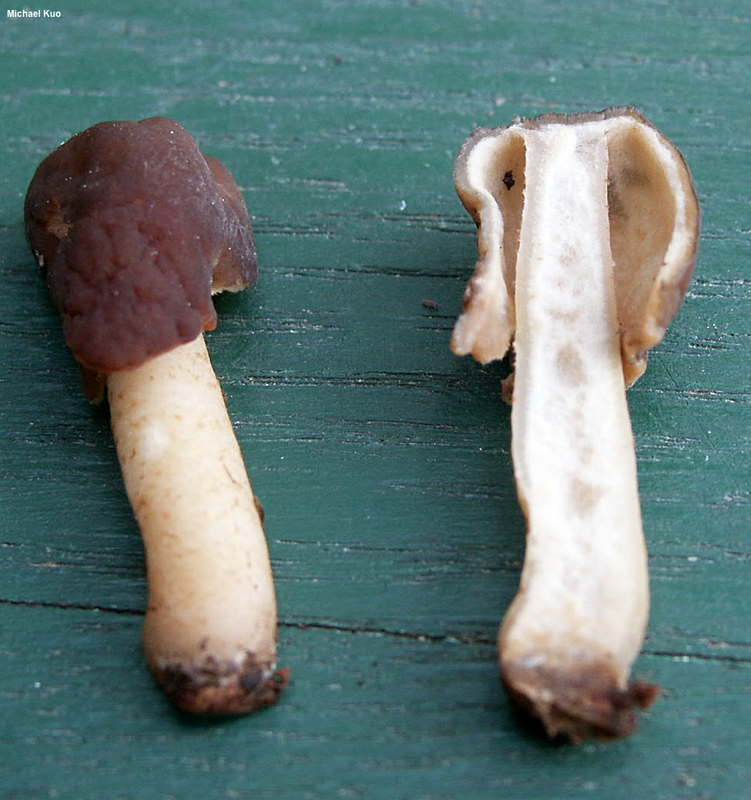 Its cap hangs free from the stem, rather like a little brown thimble on the end of a pencil. It and its cousin Verpa bohemica are sometimes mistaken for morels, but while they are closely related to these icons of fungal fanaticism, they are not true morels since their caps are not at least partially attached to their stems (also, they differ under the microscope, having spore-producing asci across the entire cap surface, while morels have asci only in the pits). At least two potentially distinct species in North America are currently passing as Verpa conica (a European species first described in the 18th Century): a large-spored, western North American version and a smaller-spored eastern North American version. 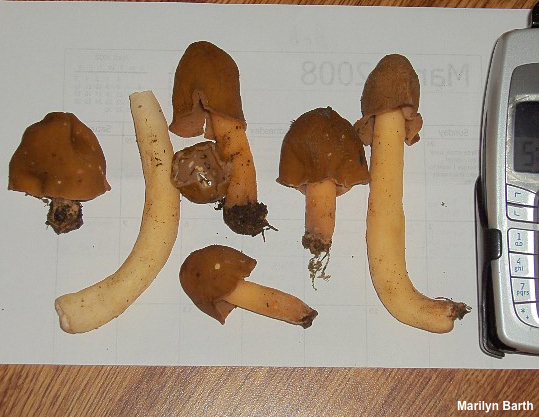 Whether either version is actually the same as the true, European species has not been investigated, to my knowledge—but the eastern version's spore sizes correspond to the European species, while the western version's spores are too large to match. The German name for Verpa conica, "Fingerhutverpel," tells you something about both the mushroom and the German language. 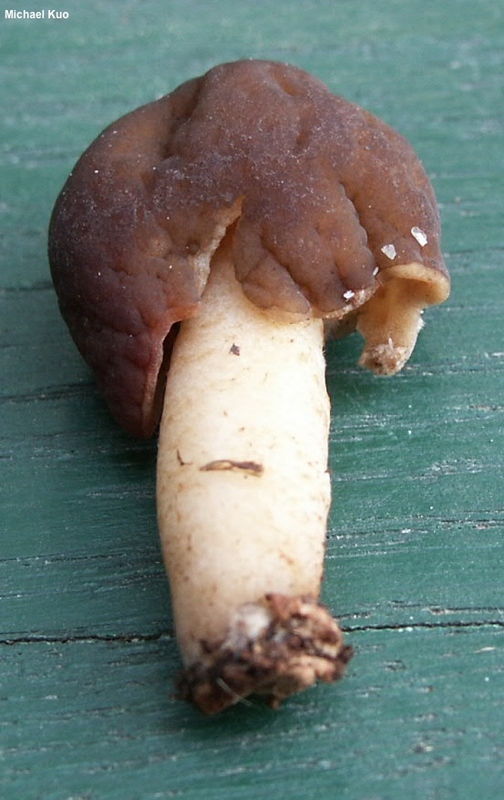 Cap: 1.5–3 cm across; 2–4 cm high; convex or, more frequently, irregularly thimble shaped; often with a slightly outcurved margin when mature; tan to brown or dark brown; bald; tacky when wet; smooth or somewhat wrinkled at maturity. Undersurface: Colored like the cap; when fresh covered with a whitish bloom. Stem: 3–12 cm long; 0.5–2 cm thick; more or less equal; creamy white to yellowish; sometimes featuring more or less concentric bands of pale brownish fibrils; hollow, but stuffed with a cottony pith. Flesh: Thin and brittle; cottony pith inside stem whitish. Microscopic Features: Spores 20–24 x 12–15 µm (28–35 x 18–23 µm in western collections); ellipsoid; smooth; walls about 1 µm thick; contents granular-homogenous; hyaline in KOH. Asci 200–250 x 15–25 µm; 8-spored. 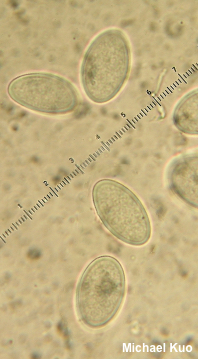 Paraphyses 5–12.5 µm wide; cylindric; septate; terminal cells with with rounded to subclavate apices; hyaline to brownish in KOH; brownish en masse. REFERENCES: (O. F. Müller, 1775) Swartz, 1814. (Saccardo, 1889; Seaver, 1942; Phillips, 1981; Smith, Smith & Weber, 1981; Breitenbach & Kränzlin, 1984; Weber & Smith, 1985; Arora, 1986; McKnight & McKnight, 1987; Phillips, 1991/2005; Lincoff, 1992; Horn, Kay & Abel, 1993; Weber, 1995; Kibby, 2006; McNeil, 2006; Trudell & Ammirati, 2009; O'Donnell et al., 2011; Buczacki, 2012; Methven et al., 2013; Beug et al., 2014; Kuo & Methven, 2014; Desjardin, Wood & Stevens, 2015; Siegel & Schwarz, 2015.) Herb. Kuo 05130302, 05200402, 04250802.